Karl Lagerfeld's personal image is as recognizable in the industry as the aesthetic behind the fashion houses he helms, which include storied labels Chanel and Fendi. While the designer leads the creative direction at said luxury brands (in addition to his namesake venture), his own signature look of a tuxedo jacket, high white collar, tie and sunglasses has proved to be highly marketable, lending him collaborations with Kaia Gerber, H&M, Diet Coke and even VIP helicopters, to name a few. Next up? The athletic world has tapped the rocker-chic businessman by way of a 13-piece Puma capsule releasing this week. The Karl Lagerfeld x Puma collaboration - the first of its kind between the sportswear giant and designer - will offer an assortment of men's, women's and unisex pieces. As this year marks the 50th anniversary of Puma's Suede Classic shoe launch, two iterations of the sneaker will be present in the mix to continue the brand's ongoing "Suede 50" celebration. Both of the footwear styles are unisex options in black and white colorways, featuring details that stamp the couturier's presence, such as removable sunglasses and a graphic. While the partnership's original intent was for the French couturier to put his spin solely on the shoe, the idea quickly expanded into a full-range collection incorporating apparel. Alongside the sneakers are contemporary streetwear items including a tuxedo-inspired track jacket for women and slim-fit hoodie for men. Each gender will carry matching sweatpants and logo tee options, as well. 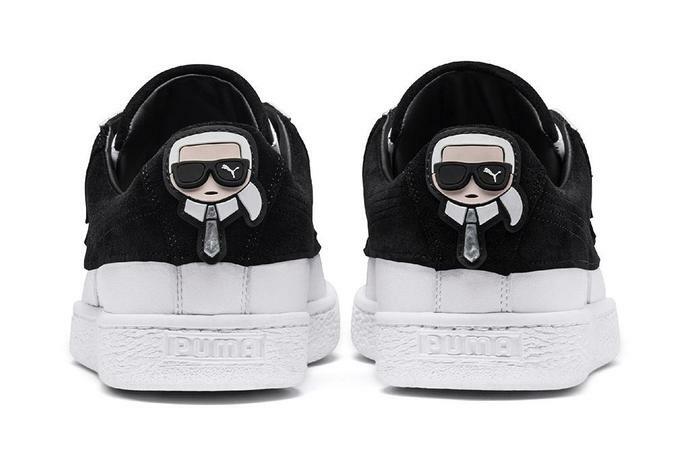 The Karl Lagerfeld x Puma collection is available for presale beginning on Oct. 18 at Karl.com. Meanwhile, the worldwide launch takes place a day later - three days following the official 50th anniversary of the original Suede Classic release - at Karl Lagerfeld and Puma retail stores, along with their respective e-commerce sites, and at select retailers.